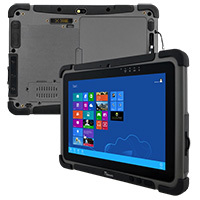 Winmate, a global leader in developing advanced rugged, mobile technologies, today announced that Verizon Wireless has granted carrier certification for its M101B, a 10.1-inch, rugged, enterprise-ready Windows® 8 tablet. 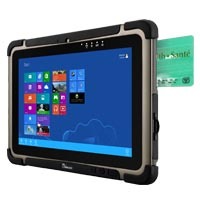 The M101B, an industrial-grade CPU, features rapid processing, robust data collection and high-powered connectivity to support communication in even the most challenging environments. 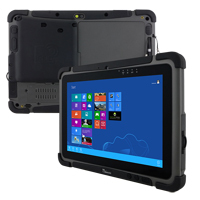 The M101B series of tablets is built for advanced computing in rugged environments with its hot-swappable battery for uninterrupted operation, and robust data capture features, which 1D/2D barcode scanners with DPM (direct part marking) technology, UHF/HF-RFID readers, and 2.0MP front and 5.0MP rear cameras. 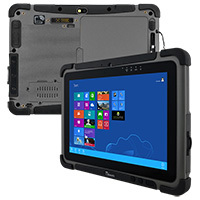 Equipped with Intel’s® quad-core Bay Trail processor and Windows® Embedded 8.1 operating system (upgradeable to Windows 10 IoT Enterprise) this rugged, mobile tablet is designed to take the place of cumbersome laptop and desktop computers, increasing efficiencies and streamlining communications whether in the field, on the manufacturing line, or on a remote oil rig. Now compatible with Verizon Wireless and AT&T Wireless, the M101B also enables high-powered connectivity and reliable wireless communication, with 802.11 a/b/g/n WiFi, Bluetooth 4.0, options for 3G or 4G LTE, and GPS. With a 64GB drive, flexible mounting options, ability to operate in extreme temperatures, and weighing just 2.6 pounds (approx. 1.2 kilograms), the M101B delivers lightweight mobility while supporting the requirements of a variety of industrial applications. Genuine Intel graphics in combination with the next-generation Intel “Bay Trail” 1.83GHz quad-core N2930 processor, ensures the M101B delivers high performance with a low-power impact. The tablet also features a brilliant, optical-bonded, 10.1-inch, projective capacitive touch screen with 1920 x 1200 pixel resolution, for readability in any environment. The M101B also comes with 7-year product lifetime support, and is now compatible with Microsoft’s latest Windows 10 IoT Enterprise release. Protected against water, extreme temperatures, thermal shock and dust, the M101B offers a more durable solution, enabling its use in even the most challenging environments. It is sealed to IP65 and meets MIL-STD-810G standards for shock, vibration and 4-foot drops to concrete.